If you ever find yourself wandering around the woods of Pennsylvania, you might discover Knoebels, a free-admission amusement park in Elysburg, PA. 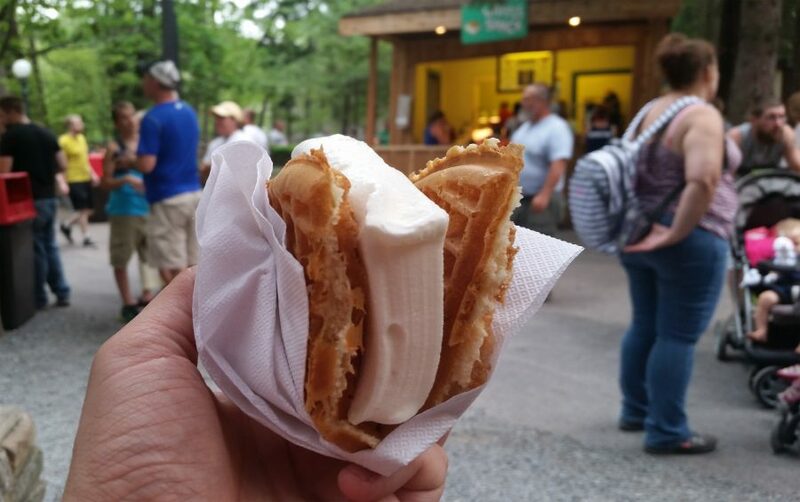 Among the many rides and treats you’ll find will be this ice cream waffle sandwich. Pre-sliced, squared ice cream makes a perfect shape to work into this waffle-half. If you’ve never indulged, it may seem like a silly combination, but once you feel the crispy edges of a waffle combine with the melting sweetness of ice cream, the only thing that will make you turn back is concern for living longer. Have them sparingly and relish the finer things in life.